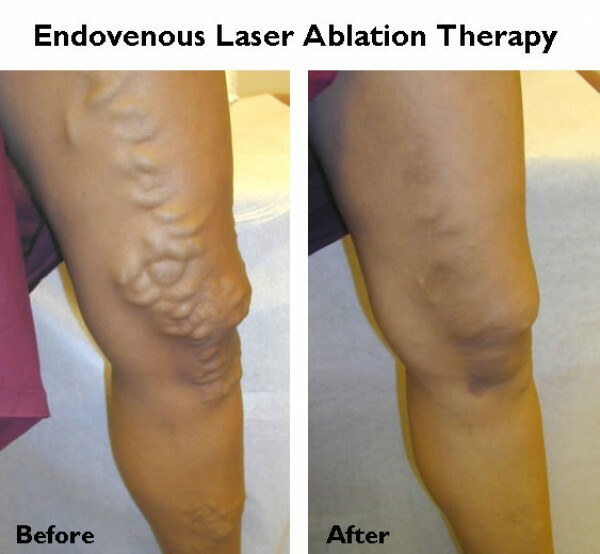 For larger varicose veins, which normally develop problematic symptoms, endovenous laser ablation has been developed to eliminate the vein with minimal damage to the body. The only marks made are from an injection of localized anesthesia and a tiny nick to insert a catheter. This procedure has close to a 100 percent success rate on larger varicose veins. The patient will be given a dose of localized anesthesia, and have their leg (or other area of the body) covered by a surgical drape. A small nick, only a few millimeters in total length, is made at the beginning of the varicose vein. Through this small nick, a catheter is inserted into the vein, and fed the length of it with the assistance of an external ultrasound wand. Once at the end, a heat source, typically from a laser, is fed though the catheter. The catheter is then slowly removed. As the catheter is being pulled out of the vein, with the heat source still on, the vein is sealed, preventing blood from flowing back through that blood vessel. Once the catheter reaches the insertion point, the heat source is turned off and the catheter is removed. In all, the procedure takes around 45 minutes to complete. Following the procedure, the patient will need to wear a compression stocking, but most normal activity can be returned to the day of the procedure. The only real restriction is lifting heavy objects, which can put strain on the newly sealed vein. There are relatively few side effect associated with this procedure, and the vast majority of patients come out complication free. In clinical trials, endovenous laser ablation is 97 percent effective and complication free, which has been backed-up by similar results in a real world application. Most patients express a reduction or elimination of problematic symptoms the same day, but it will often take a few week for symptoms to completely disappear. While complications and side effects are rare, they do occur. These are some of the potential side-effects. Heat damage to nerves in the area of the vein. This heals normally in a short period of time. Tenderness and bruising can development, but this heals quickly. In extremely rare cases, blood clots can develop in the treated vein. This is normally detected in the follow up exam.